My extended family, ranging in age from 2 to 82, descended on the DoubleTree by Hilton in Nashville’s busy downtown for a weekend wedding and a family reunion of sorts in June. We weren’t the only ones. The DoubleTree by Hilton Nashville Downtown bustled non-stop with other wedding parties, folks on vacation, and bachelorettes. Nashville, I found out, is the bachelorette party capital of the United States. Every bachelorette I met seemed happy with her stay at the DoubleTree and glad for the hotel’s close to the downtown action location. We were happy there were a few blocks between the hotel and Broadway where Nashville’s nightlife is quite the scene of bars, honky tonks and night clubs. I have nothing against bustling nightlife, but a bit of distance when it’s time to sleep is not a bad thing. The close proximity to Nashville’s action during the day allowed for time for a leisurely breakfast, a swim in the hotel’s pool, and sight-seeing before heading to the wedding. 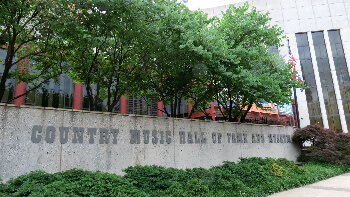 My sight-seeing involved walking from the DoubleTree to the Country Music Hall of Fame which took me by Broadway. Others in my family went shopping and took a horse drawn carriage ride. In between activities, we tested out DoubleTree’s accommodations and hospitality. Despite a few hiccups, I found the DoubleTree to be a fine place for a large family reunion type crowd to descend for a couple of days. First, since my husband, mother, daughter, son and I arrived at 10:30 pm on a Friday night, so ready to get there already, patience was not our virtue. The valet staff was quick to motion us into the unloading zone, whisked a cart in our direction and helped us unload. We debated about parking. Option 1 was to park at the DoubleTree for $25 a day with in and out privileges or park across the street at a garage not affiliated with the hotel. The valet quoted a price for that option as well and added that across the street didn’t have in and out privileges. Instead of parking, my husband followed the valet’s directions to the nearest gas station to fill up, and I checked us in. The check-in staff was friendly, noticed we seemed a bit road weary and handed my mom several coupons for a complimentary breakfast buffet. Score. Particularly, since the breakfast buffet is not normally free. Within minutes after arriving at our room, one of the valets brought the luggage and then went on with my mom to her room. Like every other staff person we encountered over the weekend, he was friendly and hospitable. 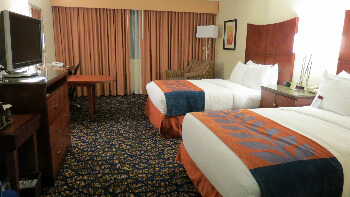 Our room, a Standard Double, was what one would expect at a DoubleTree by Hilton– tasteful and comfortable. It wasn’t particularly large, however, so I headed to the lobby once everyone else was asleep to look for a cozy place to read. Instead, I found a TV in a walkway off from the lobby and became sucked into watching “Young Guns” that western flick with a very young Charlie Sheen, Emilio Estevez, Kiefer Sutherland and Lou Diamond Phillips. Remember him? Earlier that evening, my husband grabbed a beer at the hotel’s Swanks Martini and Wine Bar. When traveling with a large number of people, it’s always pleasant to find spots to be alone for a bit of personal regrouping. 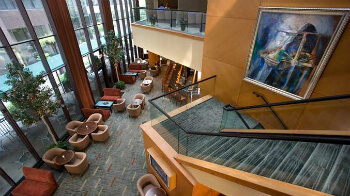 The DoubleTree offers plenty of getaway from the crowd options. We also found the hotel’s restaurant Plaza Caféto, where the ample breakfast buffet is served, to be perfect for visiting. There was room for the more than 30 of us to find tables near each other for some chat time. For a quieter place to eat breakfast, go to Swanks Martini and Wine Bar. Each of the dining areas are connected so the wait staff comes there as well to serve coffee and juice and bring refills. The indoor pool also provided space for serious visiting–and a nap. My daughter snoozed in a lounge chair while her brother swam with cousins. 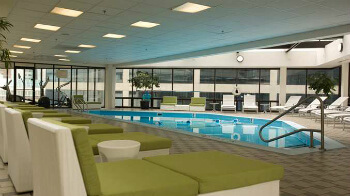 Along with the pool, the DoubleTree by Hilton also has a decent workout room with plenty of equipment. Besides the TV tucked away from the bar/lounge and breakfast coupons, my favorite part of the DoubleTree was the free hotel shuttle. Upon our walk back from the Country Music Hall of Fame, clouds rolled in and it started to pour–as in torrential. We ducked into the Hilton Nashville Downtown–a more expensive stay, where I called my husband who called the DoubleTree’s shuttle service for me. (I didn’t have the number–dumb.) Within minutes, rescue came and we were at the DoubleTree in time to get ready to go to the wedding. 1. We never did get fresh baked cookies, the DoubleTree’s trademark welcome treat. Perhaps it was our late arrival and I forgot to ask. 2. Something about my mother’s room was loud so she couldn’t sleep. The next day, she was given another room and half of her bill was taken off. 3. Our air-conditioning didn’t work well the first night, but the problem was fixed the next day and it worked beautifully from then on. 4. We were charged for one night valet parking even though my husband decided to park in the garage across the street after we unloaded the car and he went to get gas. I think the valet guy thought my husband was coming back so he put in the charge. That charge was removed once we told the desk personnel the mistake. Because we arrived on Friday and not on Thursday like a large percentage of the extended family, we missed out on the most impressive hiccup. My relatives recounted with various versions how they ended up being evacuated the night before we arrived. There was some sort of fire with a piece of kitchen equipment. The fire was quickly put out so no one was in danger, but the guests were roused from bed and sent out to the street as a precaution. 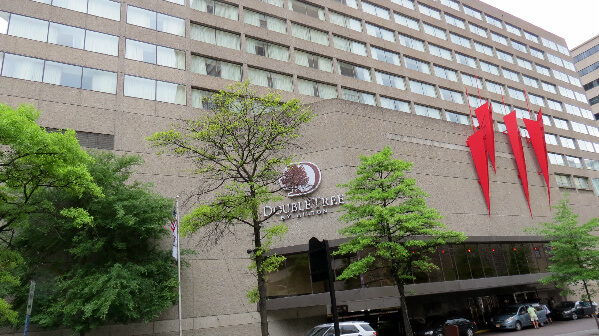 The DoubleTree by Hilton Nashville Downtown’s shuttle will take you here for free (and pick you up). Or it’s a short walk. Unless you are planning to take your car in and out of a parking garage over a 24 hour period, if you stay at the Doubletree, park across the street. It’s about $15 cheaper a day. Instead of using your own car, take advantage of the DoubleTree’s free shuttle service –or walk. Downtown Nashville is a walking kind of place. Room rates: We paid $150 per night because our room was part of a block reserved for the wedding. You can compare rates at Hotels.com or Travelocity. Post and four photos courtesy of Jamie Rhein, member of Midwest Travel Writers Association. The pool and wine bar photos courtesy of the DoubleTree by Hilton. 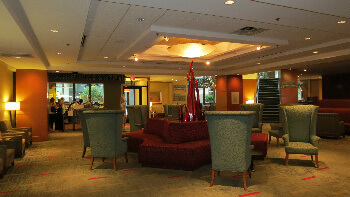 For a swank Nashville hotel option, check out Tim Leffel’s post on the Gaylord Opryland Nashville and give him applause. He won this stay.